A new update in Apple Music for Android now allows the users to save the downloaded songs to an SD Card. Although the Apple for Music boasts a wide range of features including the ones in the latest update, it has only 3.3 ratings to its credit. Hopefully, the new features in the latest update is expected to increase the ratings of the app in Google PlayStore. Don’t Miss: Google paid Apple around $1 billion to keep Google search bar in iPhone. Apple Music is known for its massive collection of songs. It has more than 30 million songs in the Apple Music catalog. 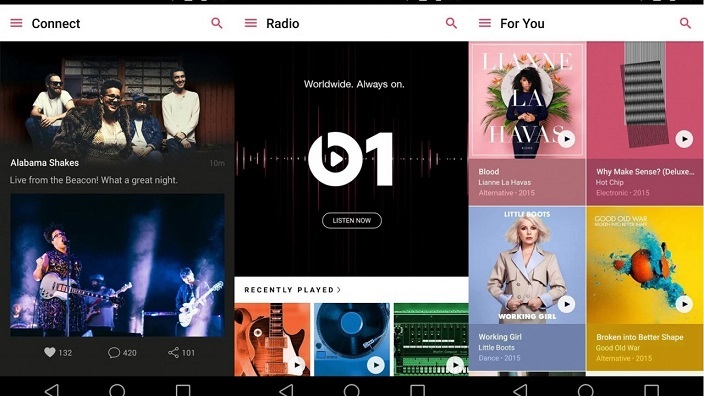 Apple Music for Android comes with a 3 – month trial, which means you can play your favorite track from a huge list of over 30 million songs for free. The app also allows you to create Playlists where you can keep all your favorite Apple Music Playlists together with your own mixes. The description of the app in the PlayStore tells that the Music Videos are coming soon. Therefore we can expect this feature to roll out in one of the next updates of Apple Music for Android. So, we would suggest you to go ahead and install the app without considering the rating of the app. Because, Apple Music is known for its quality and standards. All the leading Music Composers like Hans Zimmer and A.R. Rahman release their albums first in iTunes. Therefore, as mentioned earlier you can go ahead and install the app without thinking twice and avail the service freely for the first three months. Let us know your favorite Music Streaming app in your comments below.